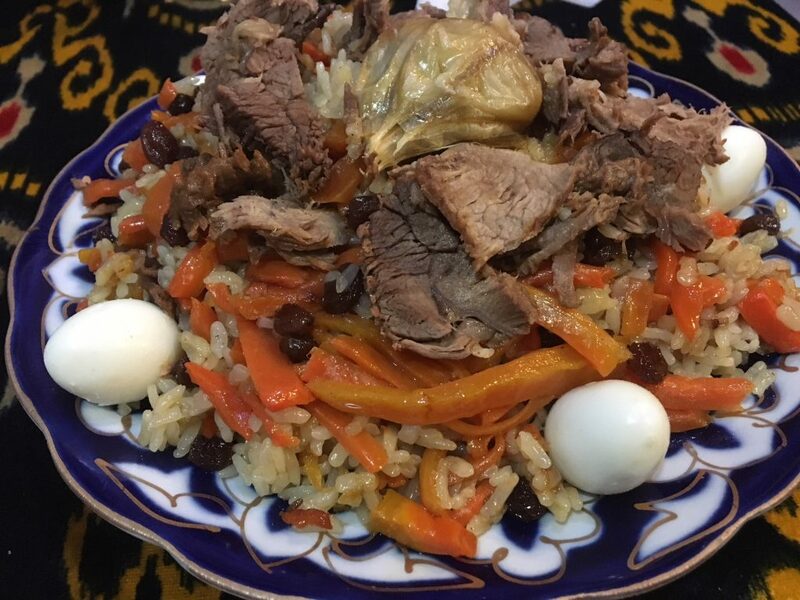 Plov (or osh or pilaf) is the national dish of Uzbekistan, a hearty main course of rice, pieces of meat, carrots and onions. It is usually cooked in a kazan (similar to a Dutch oven) over an open fire. Chickpeas, barberries, various spices and fruit may be added for variation. 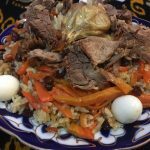 For the festive Plov Emir, the range of spices added is extensive and includes saffron, cloves, cardamom, muscat, dill seed, sweet paprika and star anise. Watch this video to see how it is made - the amount of water and spices required will vary according to the rice used. In Uzbekistan, the meat is often fried in a mixture of lamb tail fat and cottonseed oil. Wash the rice under the tap until clear, cover with cold water and leave it to soak for a while. Cut the meat with bones into cubes - the bones add more flavour. Heat the oil in a deep cast-iron wok, Dutch oven or Le Creuset casserole over high heat and fry meat until golden-brown, in 3-4 batches. Fry the onions until golden, return meat to the pot and stir well to prevent onion from burning. Add carrots, stirring occasionally, until they start to wilt and brown a little, about 15-20 minutes. Add the cumin and coriander and stir gently to prevent carrots from breaking. Cover lamb with water, approximately 2-3 cups depending on size of your pot. Season with salt. Let cook, uncovered, on medium heat until most of the water has evaporated and the meat is tender. This will take almost an hour. Turn up the heat. Drain rice and place on top the meat and vegetables in one layer, add the garlic and whole chillies to the rice. Carefully pour boiling water over rice - place a spoon or ladle on top of it to keep the rice layer from washing away. Cover rice with water until it reaches 2cm over top of rice, and bring to the boil. Allow the water to reduce a little, turn down the heat and keep it boiling rapidly. When the water has evaporated and been absorbed completely by the rice, make some holes in it with handle of a wooden spoon through to the bottom of the pot to check the water level. 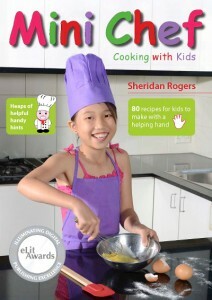 Reduce heat to very low, cover tightly with a lid and let it steam 20 minutes - the rice should remain rather al dente. Turn off the heat, remove the garlic and chillies to a separate plate. Carefully mix rice with meat and carrots, if the rice tastes bland, add more salt (and spices) mix and let it stand for 5 minutes. Pile the plov onto a big warmed platter, with the rice underneath and the vegetables on top. Serve with garlic, chilies and a salad of thinly sliced tomatoes and sweet onions (achik chuchuk) and a pot of green tea.